Environment Agency pollution and hazardous waste experts were out in force yesterday, advising businesses how to safely store hazardous materials and waste. 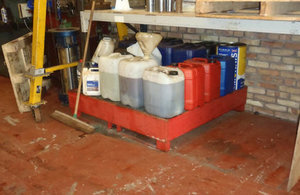 The advice and guidance Environment Agency staff gave to businesses on the Astonfields Industrial Estate, Stafford, will ensure that local businesses manage their hazardous waste and materials to help prevent pollution in the future. In this unannounced day of action, more than 50 businesses were visited and inspected by Environment Agency staff. The inspections checked a number of things, including how hazardous materials are stored, how they are disposed of, whether the site and its drains are maintained and if businesses know what to do if something did spill into surface water drains. Hazardous materials used in industrial processes can be washed into the surface water drains by rain. These drains usually flow directly into a brook or a river which means hazardous materials can pollute the water, causing a problem for fish and other aquatic life. In serious cases, a pollution can also affect other businesses who use the water for their industrial processes or even affect drinking water. By offering advice and guidance on measures businesses can take to reduce the risk of pollution, we’re seeking to make sure the owners have robust processes in place to prevent a pollution and know what to do if something goes wrong. This is really important; at the Environment Agency we follow the ‘polluter pays principle’, so if something does happen, the company responsible will have to pay the costs of clean up and recovery. The Marston Brook flows near the industrial estate and has suffered from low levels of pollution from materials washed into it from surface water drains for a number of years. It is hoped this day of action will reduce the level of pollution seen in the Marston Brook. If anyone is concerned about the business practices at any site, or if there is a pollution in a river or brook, please contact the Environment Agency’s 24/7 incident hotline on 0800 80 70 60.